Finally set about putting the various engine, clutch and gearbox elements together for fitting into the chassis. First job was to fit the flywheel and clutch to the crankshaft. The flywheel went on easily with the six bolts torqued up to the correct settings. The next item was the clutch and clutch cover plate. This is fixed to the flywheel by six 5/16" UNF bolts. The Range Rover Haynes manual says that these should be torqued to 35-40 lb/ft. However, either my torque wrench is faulty or this setting is far too high, because I never managed to get the wrench to 'click' without getting the feeling that the bolts were in fact being damaged. Indeed, one of them broke! I removed them all to check (and to remove the broken bolt from the flywheel) and all seemed OK. Having raided the steering pack of bolts for another 5/16" UNF bolt, I set about fitting the clutch again. This time I torqued them to 30lb/ft and left it at that. Anyone else had this problem? Contact me if you have and the solution you used. 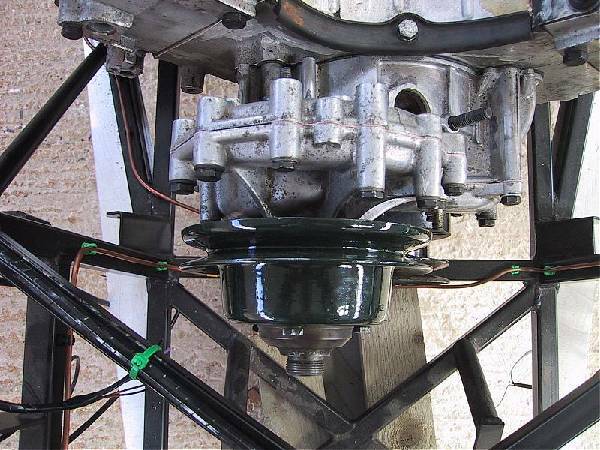 After the clutch thrust bearing was fitted to the clutch lever, the gearbox and bellhousing were mated to the engine. This went very well considering the weight of the units concerned. The engine was hoisted into its final position inside the engine bay and bolted in place using the new mounts bought from Rimmers (ouch!). It was then immediately obvious that I need not have rerouted the front transverse brake line since there was at least 30mm of free space between it and the crank pulley. The water pump was fitted along with the appropriate pulley and again there was no problem with it fouling the chassis as I had earlier feared. Unfortunately, neither the P6 nor Discovery alternator mounts seemed to offer any solution to fitting the alternator without the chassis coming into play. Indeed even after some minor mods to the P6 item, it was still touching the upper chassis rail. I have decided to try and find a small alternator and fit it low down on the nearside of the engine. This will need some thinking about and a special mount made, but this is the only location it can go due to my use of the Discovery front timing cover. In the meantime I set about doing whatever I could elsewhere. I am really snookered at the moment. I remembered (too late) on Wednesday that I needed the gearbox mount from Dax. True to form, and possibly because of the Stoneleigh show, the part did not arrive in the post in time for this weekend's planned work. So at the moment, the gearbox is being supported by a piece of 3x2! 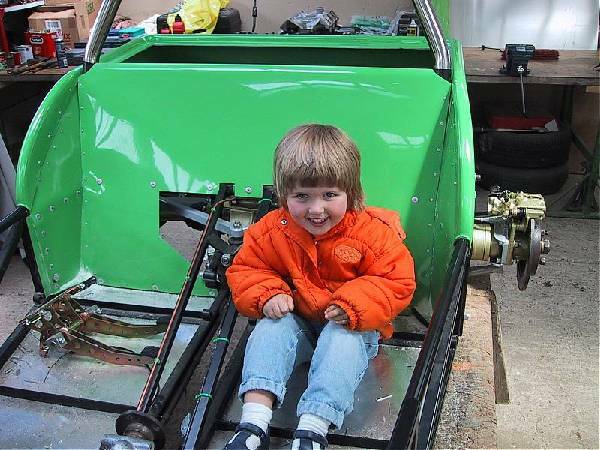 Until it's fixed properly, I can't fit the driver's footwell side panel, or the pedal box, or continue to fit the loom, or finish the fuel pipe fixing or fit the battery shelf etc. etc. 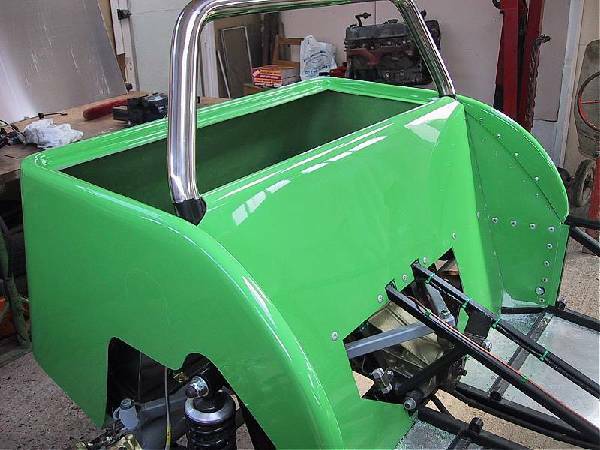 Worst still was the realisation that I should really have fitted the passenger footwell side panel prior to fitting the engine/gearbox. This is because the gearbox now obscures some of the chassis rails that I need to drill to rivet the panel into place. I will now by relying on the adhesive properties of Wurth in this area!! In lieu of finishing the gearbox install proper, I set about fitting the bellhousing coverplate. Firstly I had to cut out a small piece from the plate to make sure the clutch slave cylinder could be mounted properly. This was because the plate I had was originally from an automatic. I also made up another small plate out of aluminium to fill in the gap between the slave cylinder and the outside of the bellhousing. The fit isn't perfect but should help to prevent too much water and road clag from filling up the bellhousing. If and when I get round to fitting the 3.9 lump into the Rush, I will try to get hold of the correct manual coverplate. Fitted the Sierra handbrake lever using the Dax supplied 'adapter'. What a simple yet unreasonably fiddly job that is. Still all seems to work and it was good to see the rear calipers do their stuff after my reconditioning! Drilled the holes ready for the pedal box to go in but again need to make up the aluminium cover plate and fit the footwell panel before they can go in for good. I'm have yet to decide the best way to fit the throttle pedal. I'm considering using an M8 bolt but I'm not sure of the best way to make sure it's 'tight' without actually locking the pedal. Any comments gratefully received. Oh well, there's no rush I suppose. 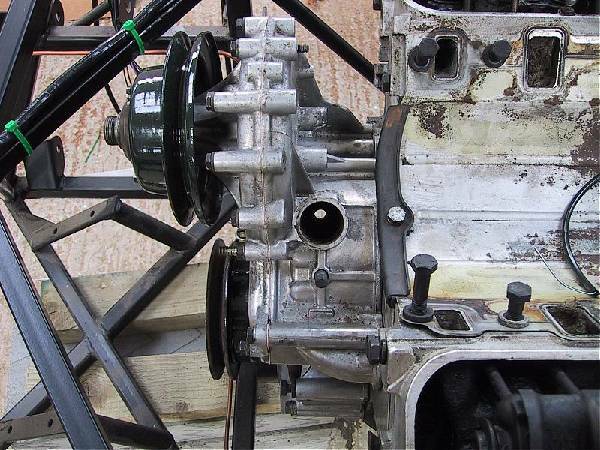 Despite ringing Dax on Wednesday 9th May to confirm despatch of the aforementioned gearbox mounting, it didn't arrive this weekend! In a less than jovial mood I called them to ask why not and was told that it was despatched Thursday (although I note that my credit card was actually debited Friday - isn't Internet banking useful!). As seems to have been the case throughout my build, unless you are prepared to go and get the parts yourself, be prepared for a long wait for the postman. I realise that there was a bank holiday and a KK show in between my order and when I might reasonably expect it to arrive but as I write this (15th May) it still hasn't arrived FOURTEEN days after it was ordered. Seems that they are too busy chasing after new customers to bother with keeping the saps that have already parted with £5K+ happy with an efficient parts operation. Anyone else had this problem??. I wouldn't mind but they never give any indication of delivery and don't seem to advise you if there are likely to be any delays. Trev's Tip:- Go and get any parts you need from the 'factory' yourself...... unless you have had the foresight to order the parts at least two weeks in advance, much valuable build time will be wasted. So it was back to what else can I do to push the project along. I spent much of the week pondering the clutch coverplate bolts and their appropriate torque setting. I felt uneasy about the way I had gone about things the previous week and, to cut a long story short (Spandau Ballet 1980 or was it '81), considered the prospect of potentially overstressed and/or damaged bolts holding a heavy object rotating at 5000+ rpm just beside my feet too much to contemplate. So given that I needed to grind a lug off of the gearbox and fit the n/s footwell panel, I decided to whip the engine out (I have negotiated long term loan of a 1 ton hoist) and replace the six clutch cover plate bolts with new ones. Having researched the matter more thoroughly, both my Haynes manuals (Sierra 4x4 & Fiesta) speak of torque settings of 12-18 lb/ft for the clutch bolts. Indeed even the Dax manual speaks of similar settings for a 5/16" bolt. So I have taken this advice and torqued the bolts to 20 lb/ft (hedging my bets) and used threadlock just to be sure. 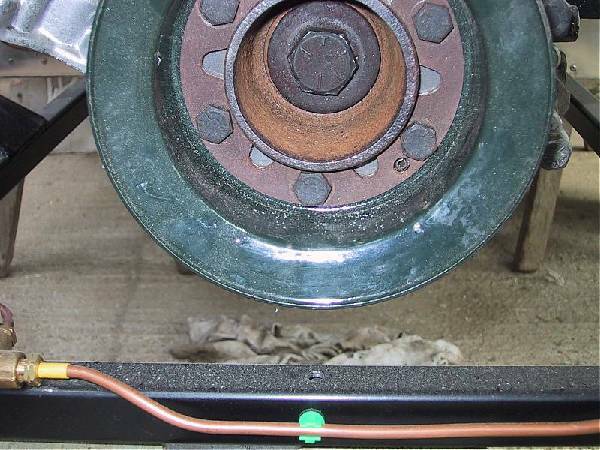 I suspect that the 35-40 lb/ft torque setting mentioned in the Range Rover Haynes manual refers to 3/8" or similar bolts that may be used to hold a more robust clutch cover plate into place. Having carried out the above repetition, I moved on to more rewarding work. Filled the diff up with the appropriate Hypoid oil and set about fitting the rear tub. This went much better than expected mainly due to the myriad of information provided on the topic by Messrs. Hoverd & Turner. 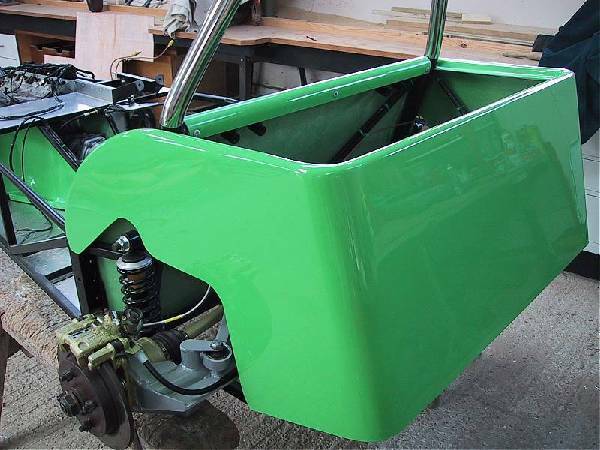 Barring cutting out slightly too much GRP to accommodate the lower chassis members everything else went very smoothly. Hmmm, no matter what way you look at it, it is VERY green. Should the Harlow chaps ever get their act together, the engine will go back in next time I get chance to work on the car. Perhaps a couple of days off work post Washington might see some real progress.